This Historic Beach Cottage is newly renovated post Katrina and fully furnished with beautiful hardwood floors. You will love the screened in porch that spans the entire length of the back of house, outdoor shower for washing off sand from the beach, charcoal BBQ and the additional cottage off the screened porch that features 1 bed (a futon) and full bath. 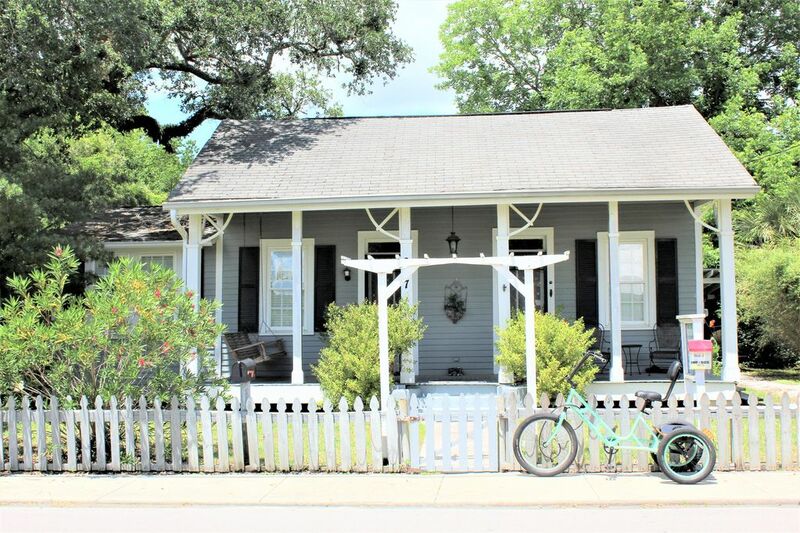 The cottage is located 1 block from the beautiful beaches of Bay St.Louis and walking distance to old town Bay St.Louis where you can experience Antique Shopping, cafe's, restaurants and art. If you like the casinos, golf, tennis, boating, swimming and fishing, we have that too, minutes away. If you are interested in renting bicycles or a golf cart to get around town, we can arrange this service for you. 1 hour from New Orleans, Louisiana, where you can visit the Historic French Quarter, Aquarium of the Americas, IMAX Theater, Audubon Zoo and Famous New Orleans Restaurants. This house is located 1 block from the beach in Bay St.Louis, MS. If you are interested in renting kayaks we can arrange this service for you. If you are interested in renting bicycles or kayaks we can arrange this service for you. The house has 3 steps to walk up in order to enter house. Relax on the open front porch, screened in back porch or under the Pergola. When you return from a day at the beach, enjoy the outdoor shower to rinse off. **additional bedding may be available upon request. Nice cottage for our annual New Years family trip. Quiet neighborhood walking distance to beach. We live close to this place. Booked it because we were having storm shutters installed and we wanted to get out of the way of the crew. The rental was not ready when it was supposed to be our check in time. Okay, no problem. But, once we actually got there, I was violently ill. We carried our stuff in and twenty minutes later we carried our stuff out. Husband took me to the hospital, but the waiting room was full and I was vomiting and I just wanted to go home. Immediately, my husband called the same phone number that he was called earlier with check in information. Husband left a message but no response. Again, the next day my husband called and left a message. No response. I finally sent a message on VRBO .We asked if we could get a partial refund. Nope. So, we have paid for a cleaning fee, pet fee, service fee, plus rental fee for simply walking in the door and out. The rental is listed at one price, but we were charged more. We looked at the prices on their calender and nowhere did we see the price we saw on the listing. We even offered the Gulf Coast Rental firm, or whatever they are called, the possibility that we could stay another time, hoping for a credit. No answer. Trust me when I say that this rental is somewhat ragged. Kitchen is nice, but that’s about it. Furniture is old, outdated, and bedding is tattered. But, we would have sucked it up and stayed if I had not gotten sick. My advice: Back off of this place and these people. Oh and by the way, it is more than one block from the beach and it does not look like the photos depicted from numerous years back. Do you not think they could have at least offered a partial refund? Naww. Beware. This is a very unfortunate situation. First of all we made several attempts to contact this party the morning of the day of their arrival. We later received an email from them asking for check-in instructions. The cottage was available at 3 PM which is our check-in time. Apparently the guest attempted to call me on my cell phone and I was in a bad area without service. I have a back up number on my voicemail, we have four contact numbers on the door of the property and in our check-in information. None of these numbers were called and we received no emails advising that they were not staying in the cottage. When we discovered that this guest did not stay due to an illness and a hospital visit, we advised that we would offer a refund if they provided proof of their hospital stay. At this point the guest advised that they had not checked into the hospital. They also said that the air-conditioner did not work. The prior guest advised that there was no problem with the air-condition and we later checked the air-conditioners and found no problems. We later received threatening emails of bad reviews. A week later we received more emails threatening of legal action and stating other reasons why they did not stay at the property. Unfortunately we had to report them to VRBO. The only complaint is that the house is left at 80F between visits and it took till the next day for the house to cool to 70. Other than that it was a great time! Thank you for a wonderful stay in Bay St Louis! Was a very cozy place for a fun weekend getaway! I will surly keep this place in mind for if i plan to return to bay St. Louis! Was sure a beautiful place in such a fun town! We are happy to hear you enjoyed your visit to Bay St.Louis. We hope to have you as our guest again in the future. Fun summer activities are just around the corner. This historical cottage is located 1 block from the beautiful beaches of the Gulf of Mexico. Minutes from restaurants, shopping, casinos, golf, tennis, boating, swimming, fishing and antique shops. Only 1 hour from New Orleans, LA. where you can visit the Historic French Quarter, Aquarium of the Americas, IMAX Theater, Audubon Zoo and world famous New Orleans restaurants. Pet Fee - $10.00 per day per pet / $50.00 minimum Please contact owner for available dates. Rates subject to change due to number of occupants, special events and/or conditions.